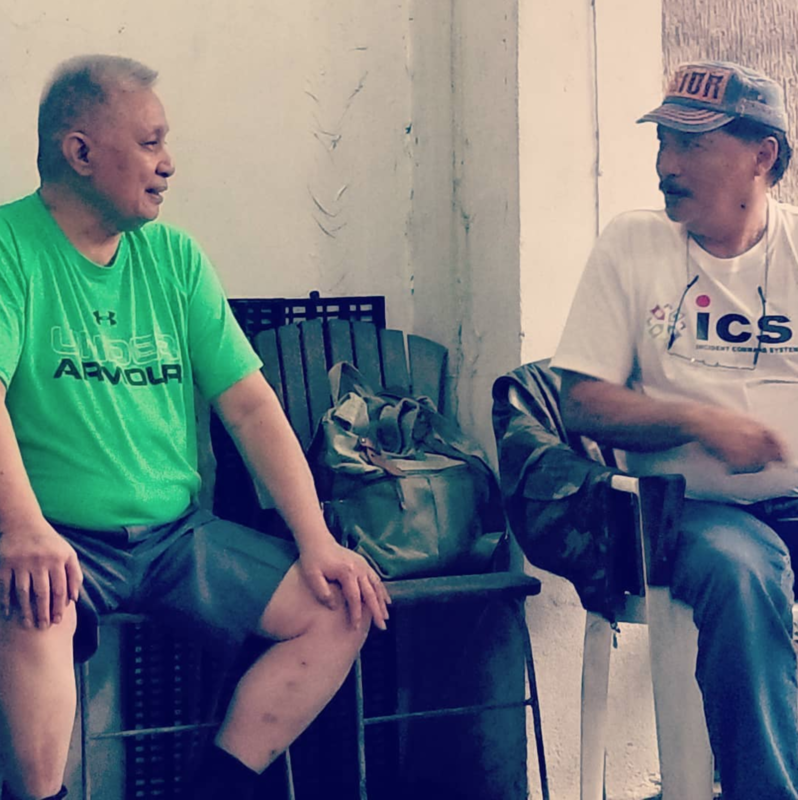 Last Saturday we were extremely fortunate to be invited to a meeting between GM Reynaldo “Doy” Baldemor and GM Macapagal. There were many formalities to be observed and understood. These men come from a time where being polite, hospitable and considerate is paramount. GM Doy lives in a small yet famous town called Paete. It is a semi rural community nestled in between the lakes and mountains and the people there know one another. It is a location steeped in history, a place where Europe and Christianity shared their knowledge and technology with the people. A place where master swordsmen continue to develop their arts. 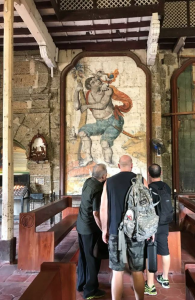 As I understand it, Lumban was at the center of these ancient Philippine martial arts and Paete is now known to be, the hub of the Paete Arnis Club. 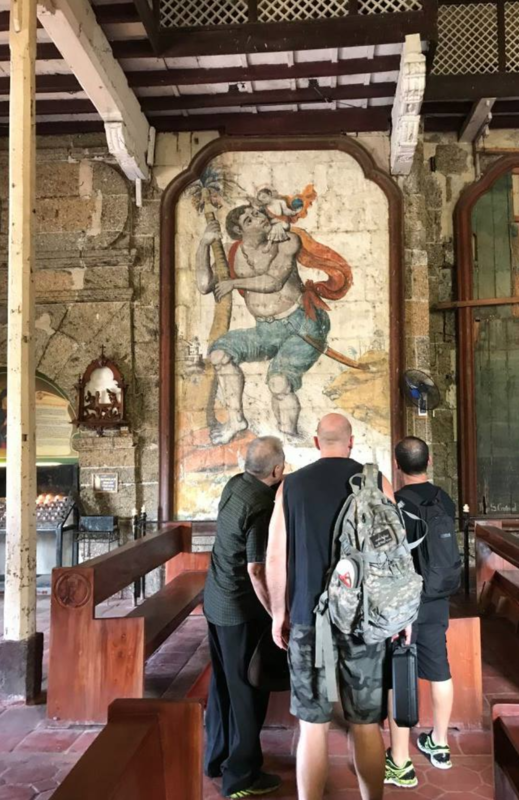 GM Macapagal told us of a church that was built in Paete in the 1700’s and of a mural that was painted at that time that portrays a Filipino-looking saint with a type of sword (briquet) that was coming into use in Europe and Spain. The use of this briquet is associated with techniques from Capo Ferro and Destreza and he indicated that these seem to influence the local fighting arts in this area of Laguna Province. When we arrived, GM Doy and his students were already introducing GM Macapagal and his students to the basic counts and steps of their system. Having had some time in with a member of the Garimot family in the US, namely GM Abundio Baet, I was able to follow along the basic steps and adjust to the few differing details. I was very happy to receive corrections and instruction from GM Doy. Very quickly we progressed to the use of the fighting postures of the system as he teaches it. As we moved forward, his studentTony Pagalanan worked the basic steps with me as the GM’s looked on and commented from the sidelines. I was very happy to be introduced to the basic format of the games that this group uses to heighten their ability to find measure. In the past I have watched it played and very much wanted to take part. The game stems from the seven attacks and defences that underpin the system. As one begins to take the correct positions vs the attacks, a turn-based game is introduced. The premise is simple, one player adopts a fighting posture while the second moves carefully into a position where they believe they can hit while refusing the hit of the first player. The positions are tested as both players ‘test’, their measure either hitting or not hitting depending on the accuracy and geometry of their positions. If the second player was successful in achieving measure, it is now time for the roles to reverse, a single move is allowed to player two and the game continues. This is a highly technical game where the competition falls almost entirely on the judgement of the two players. There were many times during the beginning of my learning the game where Tony made micro adjustments, that I didn’t even see, (and I was looking at him), where my attempt to find measure was thwarted before I knew what was happening. Of course GM Doy and his student Melan saw it each time and let me know. I have to say, it is very compelling to me, to learn this game. I can see the value in its ability even at this beginning level to develop subtle positioning changes that achieve and take measure. Melan Yasona is a very humble and talented student of GM Doy. He claims to be fairly new to the system, but I found his sharing and his advice to be very, very helpful. Regardless of his title I consider him a teacher and would accept his coaching whenever it was available. Melan, under the direction of GM Doy took me to the next level in learning the measure game that they teach. We worked on postures and distance control in a more mobile format, open ended and lightly competitive. Melan’s humility and sheer joy at training showed through each time that I occasionally got the upper hand in our play. It was through this play that I began to be introduced to the more combative version of the game, where timing and flowing movement were permitted in the positioning and measure. He is the kind of martial artist who shows his juniors his favourite strategies and winning formulas after he has demonstrated their effectiveness. That kind of character really stands out. There are not a lot of folks out there that will give away their competitive edge, but I have noticed, those who do find themselves with stronger and more challenging training partners, to develop with. While the measurement system of the Paete Arnis Club remains somewhat of a mystery to me. I now have a few new ways to find the place where I can reach and they cannot, I’m am just a little bit closer to understanding. GM Doy was very generous in his sharing of clues and methods to discover more. I am looking forward to working with him again and with more people from this line of training. I hope to one day understand fully, how they perform their particular magic. Many thanks to his students for coaching us along the way. The remainder of the day was dedicated to lunch and chat and guests of the meeting showing aspects of their training that they were excited about. For myself and Jonathan it was a time to sit back and observe the traditions of hospitality and friendly respect. It was really awesome, when topics somehow swung over to aspects of firearms training, to discover that GM Macapagal has significant credentials and experience in that area. His demonstrations of the principals of retention and counter draw were particularly impressive. All and all it was an amazing morning and early afternoon. I felt very fortunate to be permitted to be present. It is the sort of experience where it is good to be quiet and humbly watch and learn. This was a moment steeped in the old ways of the Arnisadores, and I am very happy to have witnessed everything that transpired.